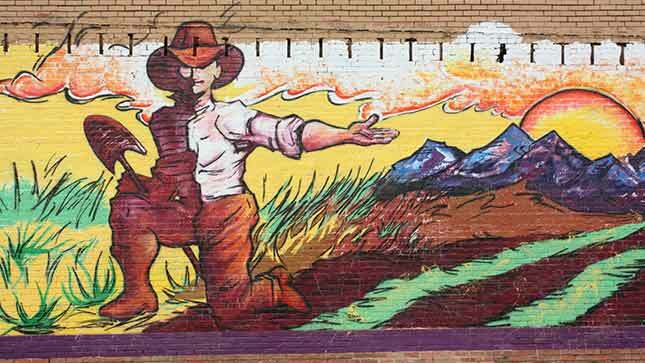 The Farmer Mural, located at 709 10th street, illustrates the melding of Greeley's agricultural roots and its arts scene. "Luminaries" sculpture is part of Greeley's public art collection. The four, 30-foot, glass towers represent the four seasons. There are more than 400 events held annually, such as this one at the Union Colony Civic Center. Greeley's Creative District. Lavender areas represent UNC. Sage - parks. Tan areas - Historic District. When many people think about Greeley, Colo., one brand is burned on their brains: Meat processing, agriculture, and dairies. Yet, there’s also a critical mass of art galleries, live performance venues, and annual events. Those artistic assets have prompted the city to seek an official creative district designation from the state. “We’d like to make sure that people realize if you haven’t been here you really need to come back and take a look,” said Assistant City Manager Becky Safarik. Those who have worked to identify the city’s creative district, like Susan Nelson of the University of Northern Colorado, said instead of a single brand, Greeley needs to be painted with a much broader brush on a canvas that includes agriculture as well as the arts. 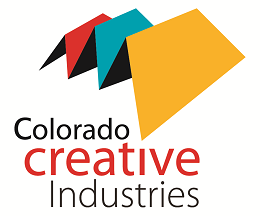 While Greeley already identifies their district as a creative one, Colorado Creative Industries is the body responsible for the official designation. Executive director Margaret Hunt said they will assess a number of factors to determine whether Greeley will become a certified district in 2014. A decision could come as soon as June. “The quality of their strategic plan, the level of their community partnerships, the concentration of creative industries or creatives within the district,” said Hunt. Seven such state recognized districts have been certified since the program launched in 2011. Some of the creative district’s were years in the making. For instance, Salida’s artistic community was an organic outgrowth of its dwindling manufacturing base. As it stands, Greeley’s district encompasses the downtown area and its cultural and historic sites, galleries and history museum. The University of Northern Colorado, with its extensive visual and performing arts departments, is included too. “Some say it’s pretty large, but this is where everything takes place. This is where performance happens, this is where education happens,” said Pam Bricker, executive director of Greeley’s Downtown Development Authority. A way-finding system has been designed to help visitors navigate the sizable district using their smart phones, Bricker explained. Café Panache, which also displays local art, is among the places the way-finding system can direct visitors to. Retired Biologist and owner Roger Brindisi said he’s noticed an increase in foot traffic since the café opened in 2011. “I absolutely love that and they just stop in, see what’s new, and go to the next gallery,” said Brindisi. “That’s exactly what we want, and sometimes they stop and eat. Which is fine,” he added with a chuckle. City sales tax reports indicate people are buying things, tax receipts were up a 13 percent in 2013 inside the district. Downtown saw a 25 percent bump. Even though Greeley has an established, growing district, Susan Nelson, Becky Safarik, and Pam Bricker all said an official creative district designation from the state would make an impact. Be the first to know about Arts District features, events, contests, and more!